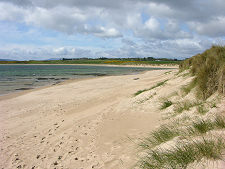 Dornoch is an east coast town by-passed by the A9, and as a result all too easy to overlook. It can be a busy place, but if you explore it in the evening or early morning, with fewer cars and fewer people, you begin to appreciate the beauty of the stone, almost pink in some lights, from which so many of Dornoch's buildings are constructed. This is best appreciated by standing in the main square, again ideally in the absence of traffic or parked vehicles. 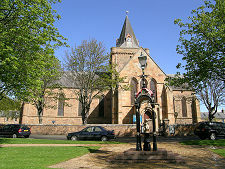 To the north is located Dornoch cathedral. 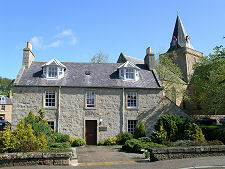 To the south is a wonderful run of buildings including the Old Town Jail and the excellent Dornoch Castle Hotel, whose origins are not as a castle but rather as the bishop's palace built to accompany the cathedral. Many other buildings are, in their own smaller way, just as impressive. 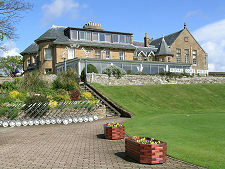 Of particular note is the use of Scottish slate on many of the roofs. This can be identified because it is not of uniform size, with the rows of slates typically getting narrower as you get nearer the apex of the roof. 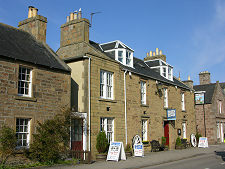 Dornoch dates back a thousand years, and it became a Royal Burgh in 1628. Other notable events in its history include the extensive damage to both town and cathedral caused by the MacKays during a clan feud in 1570; and perhaps its least glorious claim to fame, as the place where Scotland's last alleged witch was burned alive in a barrel of oil in 1722. This unfortunate old lady was called Janet Horne. She provided "proof" of her guilt by stumbling over a recitation in Gaelic of the Lord's Prayer during her trial. Whether she really turned her daughter into a horse, rode her round the town, then took her off to be shod by the devil seems open to doubt. Perhaps the real explanation lies more in the quality of the output of the local illicit still that week. The event is marked by the Witch's Stone in a side street just south of the Square. 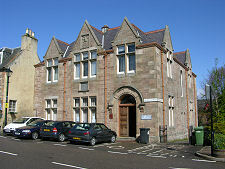 More recently, Dornoch achieved a few days of fame on the world stage when the pop star Madonna chose Dornoch Cathedral as the location for her son's christening in December 2000 and the nearby Skibo Castle for her marriage. Celebrity christenings aside, the name of Dornoch is primarily known for its golf. The story goes that many of the priests who came to service the cathedral were first trained in St Andrews: and in Dornoch they found a similar coastal landscape equally suited to golf. 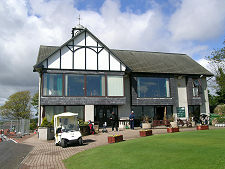 Dornoch's championship course lies immediately to the east of the town itself, between it and the sea. It is said to be one of the top dozen golf courses anywhere, and it is certainly the most northerly championship course in the world. As a result it has become a place of pilgrimage for those who tour the world collecting the best courses. Beyond the golf course (more accurately, courses) lies the sea and some wonderful beaches. These turn more rocky to the north, providing hours of enjoyment for those who want nothing more than watching a world in miniature in a rock pool.